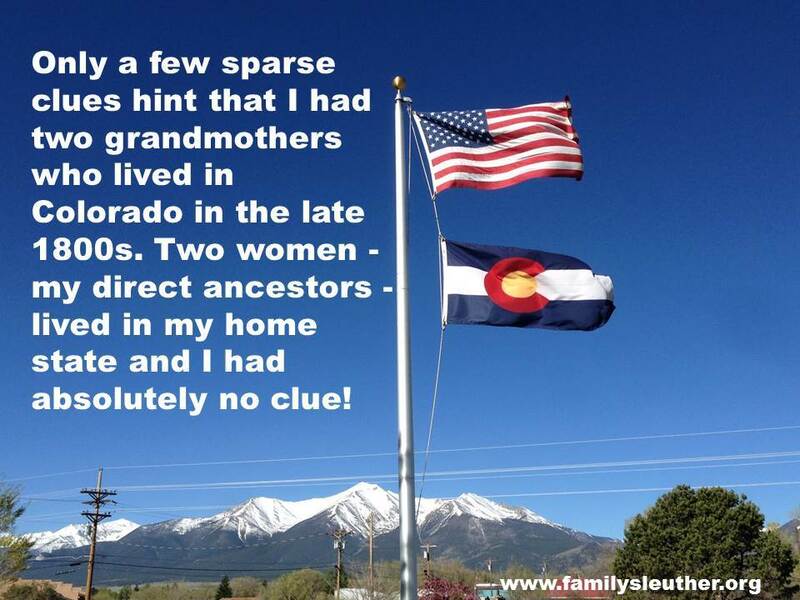 Only a few sparse clues hint that I had two grandmothers who lived in Colorado in the late 1800s. 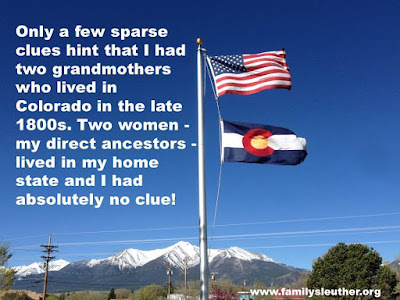 Two women - my direct ancestors - lived in my home state and I had absolutely no clue! I've been researching my ancestry for six years. While I am embarrassed to admit that I have yet to map out my link to Adam and Eve or Charlemagne, I thought surely I had already identified and plucked all the low-hanging fruit. How could I possibly have overlooked these two women - my elusive grandmothers? Well, if I need an excuse then I blame the missing 1890 census. Without this catchall resource, I very nearly missed them and their presence in the Centennial State. Fortunately, a few records hinted at their existence and location. They're on my radar now, and I'm prepared to research the heck out of them! 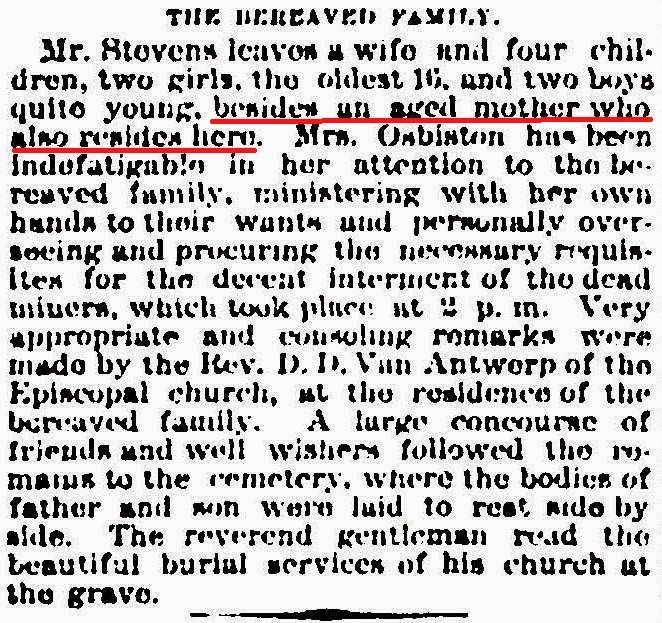 A fourth great-grandmother whose name still remains unknown to me was briefly mentioned in a newspaper account detailing the untimely death of her son Thomas K. Stevens. Thomas was killed in November 1886, along with his eldest son, in a Colorado mine explosion. It was a ghastly end, although not altogether uncommon in the state's dangerous, poorly regulated mining industry. A Rocky Mountain News article offered a gory play-by-play of Thomas' final hours after the explosion (Yes! Tragically, he was not killed instantly and lingered in agony just long enough to absolve the mining company of any wrongdoing). The reporter added a single line that hinted at great-grandma Stevens' presence in Colorado: "Mr. Stevens leaves a wife and four children, two girls, the oldest 16, and two boys quite young, besides an aged mother who also resides here." Records that might reveal Thomas' parents identity were slim for that time. Colorado did not keep death records in 1886. The 1880 census showed him working as a miner living with his brother Richard in Idaho Springs, Colorado. This same census stated that Thomas was born in England as were both his parents. However, brother Richard's birth location was listed as Wisconsin. At 23 in 1880, Richard would have been born in about 1857. The Stevens family must have immigrated to North America before that time. Furthermore, I know that Thomas married Susan Day in Nova Scotia in 1866. Did Thomas immigrate with his family to North America, but stay behind in Nova Scotia while his parents continued to Wisconsin where they had more children including Richard? 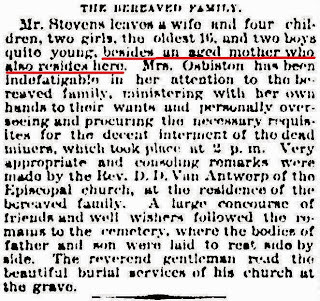 Prior to discovering this newspaper article, I mistakenly assumed both Thomas' parents pre-deceased him and were perhaps buried in Wisconsin. The puzzle hasn't come together yet, but further research into the extended family may provide the clues that give a name to my anonymous great-granny Stevens. In October 2015, I traveled to Potenza, Italy and walked the streets of my ancestors. I assumed that my third great-grandparents Vincenzo and Vinceza (Raimondi) Ruoti both lived their entire lives in the tiny mountain town. After all, I had found documentation of their Italian births and Vincenzo's death record. But I was never able to locate Vincenza's death certificate. Recently, a distant Ruoti cousin shared with me a typed family genealogy that included basic vital dates for Vincenza. Her death date and location were provided. Surprisingly, she didn't die in sleepy Potenza, but in Denver! Apparently, my third great-grandmother - whose full name was Angela Raffaela Vincenza (Raimondi) Ruoti, or Vincenza for short - had traveled from Italy to the United States to live with her immigrant children following the death of her husband. I had mistakenly assumed she lived out her life in Italy. Her emigration explains why I never found her Italian death record. She didn't die in Italy. On a recent trip to Colorado, I jumped onto a microfilm reader at the Denver Public Library. I wanted to see if there was an obituary. I knew the odds were not in my favor. Obituaries were less common during this time, particularly for immigrants. However, I immediately landed on an article that raised my eyebrows. In the March 20, 1890 Rocky Mountain Daily News - the day after Vincenza's purported death - I found an article detailing the passing of an "aged Italian woman." Her name was Beatrica Raymonde. Beatrica is very different from any of the given names for my third great-grandmother. Beatrica and Vincenza were aged Italian women in 1890. Both women died on March 19, 1890. Both women died in Denver. Both women suffered from heart disease. Both women shared the name Raymonde. Vincenza's maiden name was Raimondi. Collectively, the commonalities between the two women make it difficult for me to dismiss the article outright. I Googled the name Beatrica to see if it was a nickname for any of Vincenza's given names. It was not. What I did learn is that Beatrica is Latin and means voyager. That's quite apt for Vincenza who did voyage across half the world, leaving behind everything she knew to start a new life in the Mile-High City. I've written to the Denver Catholic Archdiocese to see if they have funeral records that may shed light on the identity of Beatrica Raymonde and help me determine whether she's my great-grandmother Vincenza. 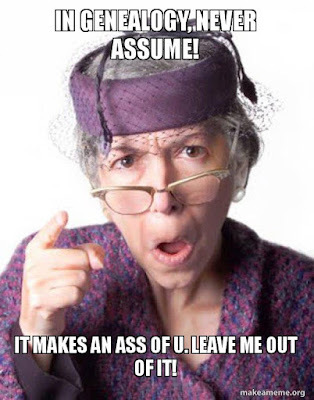 My elusive grandmothers have reminded me of an important lesson in genealogy. Never make any assumptions! Keep all possibilities on the research table until you have evidence to refute or support a theory. Duly noted!